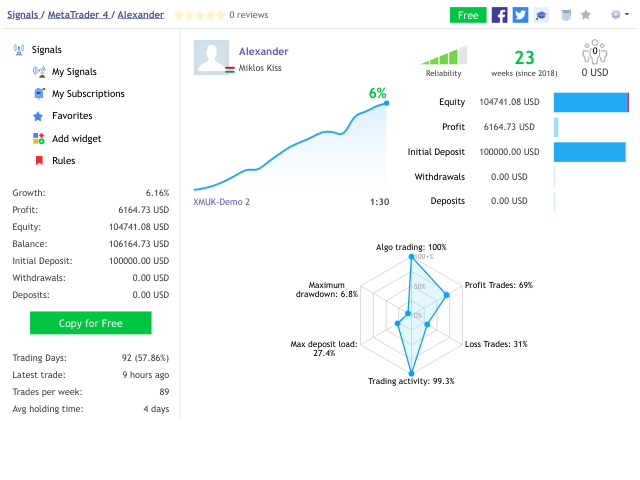 Alexander is a multi-currency grid trading robot which trades based on currency strengths. It monitors available market symbols to find strong/weak currencies and trades symbols of which one is strong and the other is weak. The EA uses grid if market goes against the initial trade. First few orders of the grid use the same lot sizes follow up trades are incremented. The grid can be limited -- see later. Trades are only opened if the free margin is below a preset limit. 3 types of stop loss are present: a 500 point limit in case of connection problems (is always extended if necessary), a per symbol maximum drawdown (see later) and a global equity protection (see later). If there are trade signals on highly correlated pairs only one is taken (the one with the lowest spread). The default parameters are the recommended settings. This EA requires a sufficiently large account (10k USD for 0.01 lots -- can work on cent based accounts too). Overtrading exponentially increases the chance of loss! Attach to any chart, any timeframe. Attach to 1 chart only. MaxSymbolDDPercent: (default 8) the maximum drawdown percent a single symbol may have before stopping out. If reached all trades of that symbol are closed with loss. Warning: trading this EA should be considered risky. Do not trade money you cannot afford to lose. Note: the EA cannot be properly backtested. Please do a forward test to evaluate performance.